Sat., 24 Aug. - Mon., 9 Sep. Tue., 3 Sep. - Tue., 10 Sep. Tue., 19 Nov. - Tue., 3 Dec.
Wed., 23 Oct. - Wed., 30 Oct. Thu., 14 Nov. - Mon., 25 Nov. Thu., 21 Nov. - Thu., 28 Nov. Sun., 29 Sep. - Wed., 9 Oct. Tue., 19 Nov. - Mon., 25 Nov.
Wed., 8 Jan. - Mon., 13 Jan.
Wed., 22 Jan. - Sun., 9 Feb. Sun., 6 Oct. - Wed., 9 Oct. Mon., 11 Nov. - Tue., 19 Nov. Thu., 9 Jan. - Sun., 12 Jan.
Fri., 10 Jan. - Mon., 13 Jan. Mon., 11 Nov. - Mon., 18 Nov. Tue., 24 Sep. - Thu., 3 Oct.
Fri., 10 Jan. - Sun., 12 Jan.
Wed., 28 Aug. - Fri., 6 Sep.
Fri., 23 Aug. - Fri., 6 Sep. Thu., 5 Sep. - Sat., 14 Sep.
See all 2,650 properties in Daniel K. Inouye Intl. 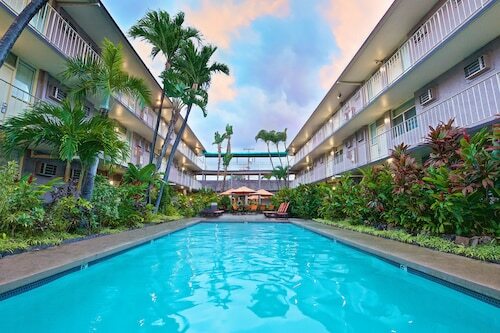 This Honolulu hotel is just a half-mile from Honolulu International Airport. 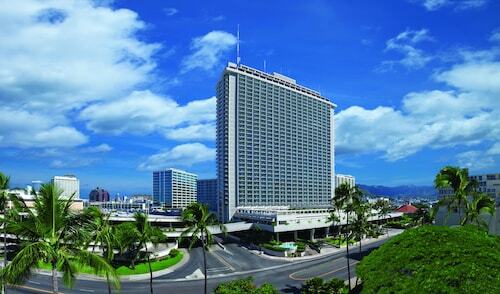 Located in Western Honolulu, this hotel is 0.6 mi (1 km) from Keehi Lagoon Park and 2.2 mi (3.6 km) from Honolulu Harbor. Moanalua Gardens and Navy Marine Golf Course are also within 3 mi (5 km). 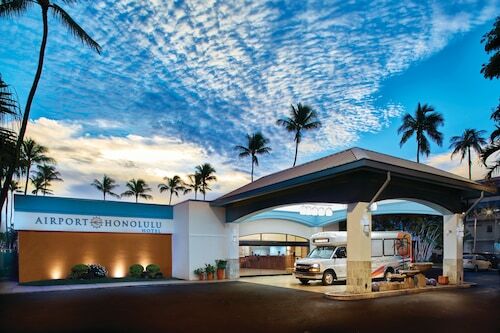 4 miles from Pearl Harbor Naval Station, this hotel is just a half-mile from the airport, with a complimentary 24-hour airport shuttle. 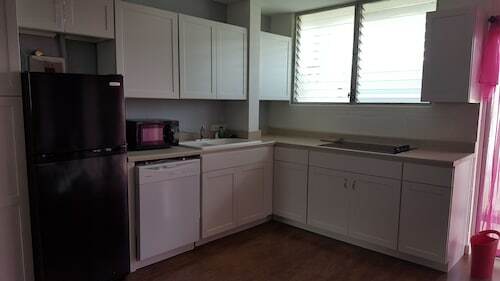 Located in Foster Village, this vacation home is 1.3 mi (2.1 km) from Moanalua Gardens and 2.8 mi (4.5 km) from Honolulu Harbor. Keehi Lagoon Park and Navy Marine Golf Course are also within 3 mi (5 km). Located in Western Honolulu, this property is within 3 mi (5 km) of Honolulu Harbor, Hawaii Theater, and Aloha Tower. Iolani Palace is 2.8 mi (4.4 km) away. Question : What is the cheapest date to fly to Honolulu? 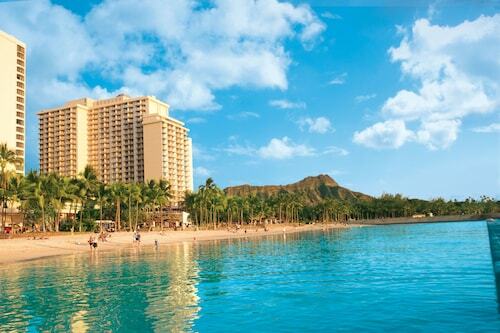 Answer : As of Apr 15th, the best day for deals to Honolulu (HNL) is May 8th. A ticket will run you $576, which is 33% less than the average price to book the same route. Answer : The cheapest day to fly from Montreal to Honolulu is on Tuesday. So, if you want to save a little cash on your next getaway look for flights on Tuesday. Answer : You sure can and you may save yourself some money by changing when you take off. The cheapest day to fly in April is Tuesday. If you are able to go with the flow, you may just find that you can pocket some cash. Question : How long do most people stay in Honolulu on average? Answer : Of course, you are not most people, but if you were, you'd stay around 17 days. Question : What is the cheapest airline flying from Montreal to Honolulu? Answer : Air Canada is your best friend for finding that sought-after low fare. They offer fares as low as $525, while prices for similar flights can cost as much as $2,510. Question : How much is a plane ticket to Honolulu (HNL) from Montreal (YUL)? Answer : Cost can range from $525 to $2,510, prices for YUL to HNL do change more than most routes from Canada. Prices tend to be better the further out you book.